I've always been a 'map freak.' I think my Grandson may have inherited that. This page is a collection of maps, historic and current, of the region. This map is from the National Park Service's PDF of the trails and description of Miller Woods. Click on the map to open the PDF in a new window. 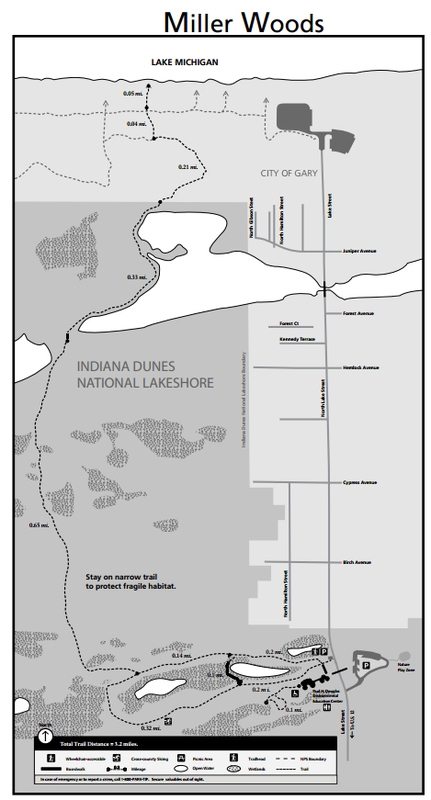 There are more maps and information about the trails in the National Lakeshore: check out their site index. Click on the maps for a bigger image. This cool map (click for a larger view) is a section from the 1900 U.S. Geological Survey map. The map is labeled Tolleston, IND and is based on a survey done in 1897. The section that I've cropped shows the county line on the east. The Baltimore and Ohio Railroad tracks (now the CSX tracks) cross the Lake Shore and Michigan Southern tracks at Miller. 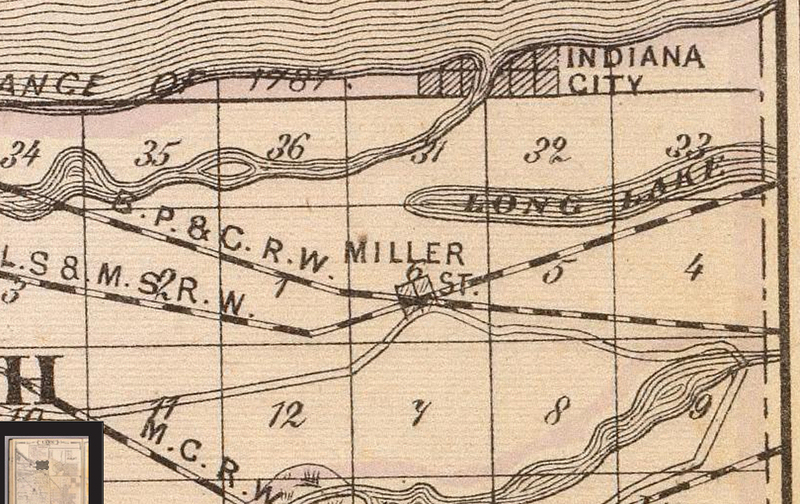 Those tracks went right down what is now Miller Avenue and were moved north when Gary was built in 1906. More information on the Lake Shore RR are on this page which show some amazing pictures taken in Miller in 1906. Notice also how far Long Lake extends westward, almost to Lake Street. Also the course of the Calumet River goes almost all the way to the Lake/Porter county line. The mouth of the river is shown only by that little nub, which was about where the north end of Montgomery Street is now. Interestingly, the surveyor did not connect the 'nub' to the lake, but, like the mouth of the Chicago River before it, this land was no doubt a swampy wetland, flowing well in the spring and backing up from the lake depending on the wetness of the seasons. "In 1841, Congress created the Lake Survey within the U.S. Army Topographical Engineers, which later became part of the U.S. Army Corps of Engineers. The Survey, based in Detroit, Mich., was charged with conducting a hydrographical survey of the Northern and Northwestern Lakes and preparing and publishing nautical charts and other navigation aids. 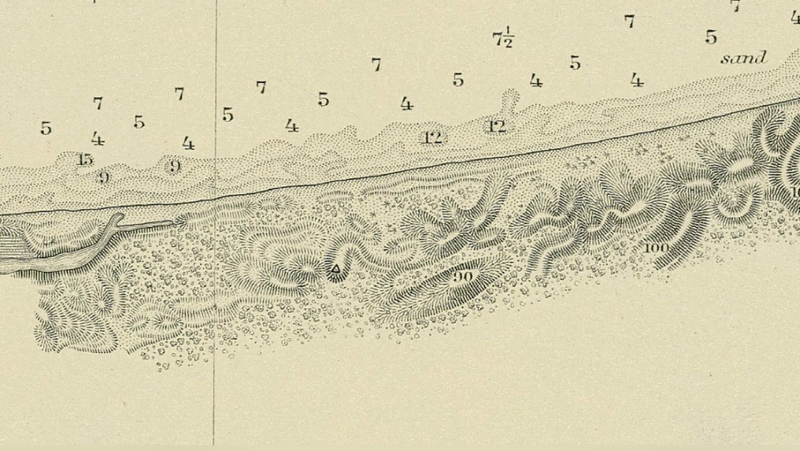 The Lake Survey published its first charts in 1852. In 1882, after producing 76 charts, it had completed its Congressional mandate." Thanks to Simine Short for bringing these maps to my attention. 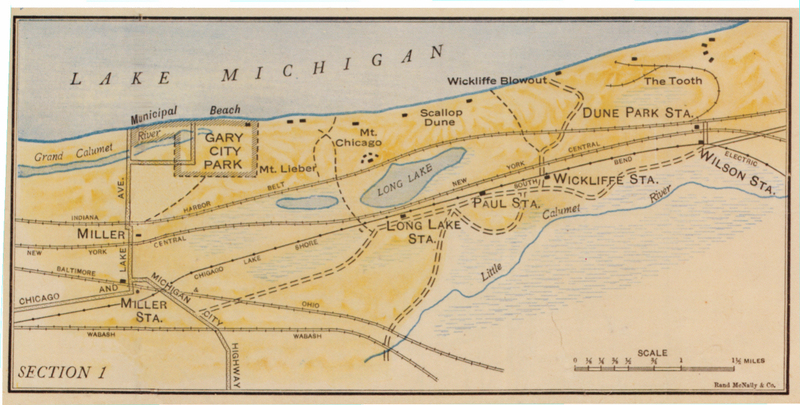 Goodman, P S. Rand Mcnally Map of Indiana Dunes: The Wonder Region of the Middle West. Chicago, Ill: Rand McNally & Co, 1918. Dudley, Frank V, James R. Dabbert, Richard H. W. Brauer, and Gregg Hertzlieb. The Indiana Dunes Revealed: The Art of Frank V. Dudley. Valparaiso, Ind: Brauer Museum, Valparaiso University, 2006. Print. See: Engel, J R. Sacred Sands: The Struggle for Community in the Indiana Dunes. Middletown, Conn: Wesleyan University Press, 1983. Print, pages 46-48.for the history on the maps. Chanute Related Maps are on their own page: There is a close up of Marquette Park in Miller that shows the location of "Chanute Hill", where Chanute&apos;s first experiments of 1896 occurred. 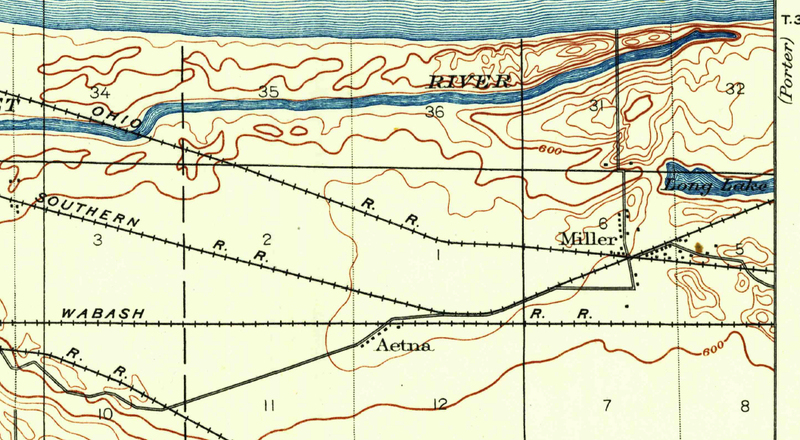 This map also shows the original course of the Grand Calumet River and where it emptied into Lake Michigan. The location of First and Second experiments of 1896 is shown on this map.